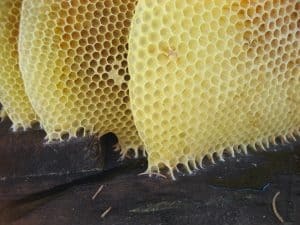 Beeswax in its natural form of honeycomb in a bee hive. Beeswax is an essential product of a beehive that we often do not link directly to bees. The wax is used for combs in the hives, where bees store the surplus of honey and pollen and raise their offspring. Beeswax is the natural building material for honeycombs. The flexible and at the same time stable material is just ideal for its purpose. How do bees build the honeycomb? The worker bees of most bee races start with the wax building task once they are 12 days old. The building process of the honeycomb cannot be done by a single bee. Therefore, a bunch of bees get together for the building process. Their bodies produce about eight little flakes of wax, which are pressed through the eight adenoids at the sides of their bodies and then chewed. 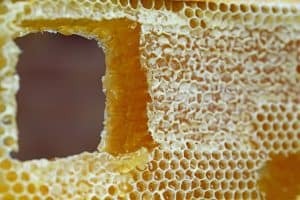 The bees chew and process the wax flakes with saliva and other enzymes to produce the honeycomb1https://www.livestrong.com/article/271409-allergy-to-bee-pollen-allergy-to-beeswax/. Colonies need a lot of time and energy for the wax building process: To produce 1 kg of wax, bees “burn” roughly 4-10 kg of honey during spring and early summer, which is the typical honeycomb building period. 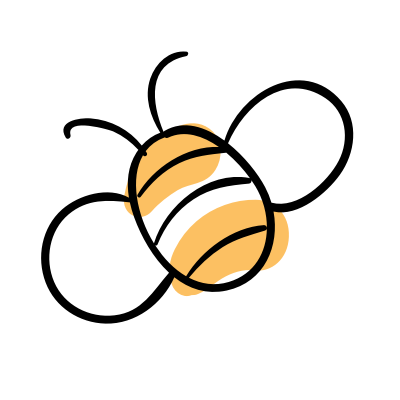 Therefore, some beekeepers use pre-pressed honeycombs for their hives, which saves a little time and energy for their bees. Other beekeepers prefer providing only the frames. When you think of honeycombs you probably have wax in a dark yellowish color in mind. Guess what, the wax was not that yellow in the beginning! When bees build their own honey combs the wax is white as snow! Only with the time the wax becomes yellow, once the bees pressed pollen and nectar into the combs. Moreover, when the larvae hatch and leave the combs the wax also contains their excrements and skin remains2https://beeswaxco.com/bees-making-wax/. 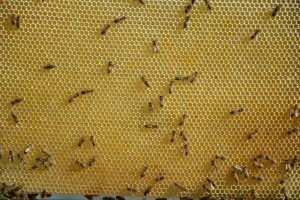 As combs get older, beekeepers remove combs for hygienic reasons to avoid illnesses. Old combs have benefits for bees and humans, as bees cannot remove old combs themselves not extend the sizes of the bee hives, the beekeeper makes more space for new honeycombs. This protects hives from getting ill and at the same time the old wax can be used for many different products, as we will show you in a later section of this article3https://propolis-ratgeber.info/bienenwachs/. After melting and filtering, the beeswax can be used as an ingredient for home-made lotions or creams for instance. When you search for natural beeswax you may come across two different descriptions and it will be useful to know which one you should be looking for. There is yellow wax (Cera flava) and bleached wax (Cera alba). Only the yellow wax can be considered as natural bee product. Yellow wax is the natural yellow bee wax that has only been melted and purified so it can be used for other products. This wax has a rather soft texture that can be kneaded (like clay for example), it melts at a temperature of 61 – 66° C but cannot be solved in water. It has an intense honey smell but no taste4https://www.researchgate.net/publication/304012435_Beeswax_Production_Properties_Composition_Control. Bleached wax, in contrast, has been purified through a bleaching process. The honey smell is not very intense but it has similar qualities as cera flava 5http://www.pharmawiki.ch/wiki/index.php?wiki=Bienenwachs. How do we use beeswax in our daily lives? Beeswax is used to produce bee wax candles. However, the industry is focussing on cheaper production methods for candles nowadays. In the health and beauty industry beeswax products are very popular. Creams, lotions, soaps and even products as lipsticks contain beeswax as a base. As bee wax is a natural product with non-allergic properties and is very kind to the skin, it is ideal to be used directly on the skin and therefore part of many skin care products. Even sensitive skin types hardly have problems as redness or irritated skin after using products with beeswax. Some heat packs contain bee wax to relax joints or to treat complaints as inflammations or muscle pains. In ancient times, people also used beeswax as filling for holes in their teeth. It also has anti-inflammatory properties and antioxidant qualities that can benefit the body6https://www.livestrong.com/article/271409-allergy-to-bee-pollen-allergy-to-beeswax. Beeswax is used in the food industry as an alternative coating for candies, fruits, nuts or coffee beans for example. This is also the reason why some wine gums are not vegan. It should be mentioned though that more and more companies are starting to use alternative, plant-based substitutes . Beeswax is also used in various technical applications, for instance it is used as furniture or shoe polish or as a leather care product7http://www.pharmawiki.ch/wiki/index.php?wiki=Bienenwachs. Do your own creams with beeswax! If you would like to make your own products that contain bee wax you will find plenty of recipes online. Local pharmacies and drug stores often sell beeswax as a raw product.